Your Entry Pitch is the official knock on our door to enter the Chemovator program. You have a business idea, formed a team and now you want to join Chemovator? With a successful Entry Pitch you will become one of our Venture Teams! Submit your idea proposal on our application form below. Briefly describe the problem or market need you have identified and explain how your business idea will solve it. Your solution should be innovative and new, but already have a certain level of maturity to allow quick market testing. Complete your application by introducing your Venture Team and the skills offered by each individual member. We will then evaluate your proposal and come back to you with feedback to be shared in a first meeting. If we see a potential fit to Chemovator, you will be invited to our next official Entry Pitch. 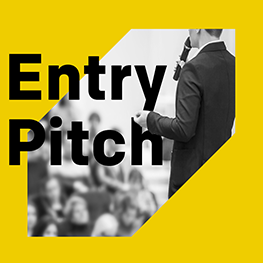 All Entry Pitch dates are published here. At the Entry Pitch, you present your idea to a jury consisting of Chemovator employees and our Entrepreneurs in Residence. If you convince the jury, you are accepted to enter our program as a Chemovator Venture Team. The jury can also invite your team to a Re-Pitch to address open questions or do some more research to facilitate a final decision. A Re-Pitch is typically scheduled one to two weeks after the Entry Pitch. What happens if you and your Venture Team get accepted? Your team gets access to Chemovator and its resources for up to two years. During this period you will develop idea into a fundable business plan.You will test and refine your offering with market and customer feedback. The Chemovator Team and our Entrepreneurs in Residence will support you with guidance and coaching, office space, access to subject matter experts and many more tools to allow for a fast and targeted development of your venture. Initially you will go through a three-month long Validation Phase. Here you will define the key assumptions and risk factors of your business case and start testing these by gathering internal and external feedback. At the end of the Validation Phase you will pitch your findings and suggested next steps once more to our jury to apply to enter the Incubation Phase. This will last up to twenty-one-month and in the case of successful incubation end with a decision on how and where to continue to build your business. During your journey we will challenge the business idea and the team to see if things are on track, need to pivot or if major changes are needed. We know we are dealing with very early stage and high-risk ventures. It is natural that things do not play out as planned. In case we do not see the light at the end of the tunnel ventures may also be terminated at any stage. To us this is not a failure at all. Having tried is what counts along with the learnings that have been generated along the way. By the way, your assignment during the Incubation Phase – arranged in coordination with your unit’s HR department and supervisors – will happen in form of a delegation. This guarantees that, whatever happens, you can return to your former business unit. Who can join the Entry Pitch at Chemovator? Every BASF employee can apply for an Entry Pitch. At present, we only accept applications from BASF employees. But wait! We will open-up to external startups soon, so stay tuned! Your idea should be an original and unique business idea. Not a technology pitch. It should relate to the chemical industry. You have 10 minutes to pitch your idea and convince the jury of your project - it's your choice how you do that. We will ask you, however, to provide your presentation or any other material you want to use in advance, so we can get familiar with the content. Not sure or not ready yet? There are other ways to engage with us and our community prior to a pitch: Join us in one of our Startup Bootcamp to refine your idea with experts and learn how to pitch. Or join us at Open-Mic @ Chemovator to pitch, hear pitches and network in a casual and fun setting.